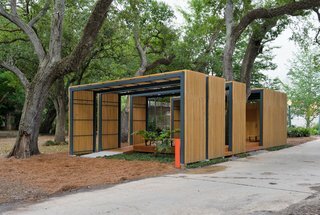 These thoughtfully designed outbuildings exhibit how the utilitarian backyard shed can be adapted for work, storage, and living. 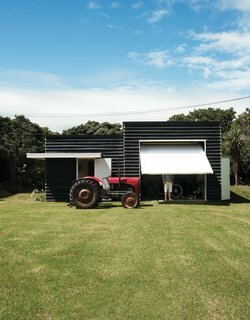 Typically viewed as a simple, single-story structure designed and built for utilitarian purposes, the shed as a building typology is seeing a surge of popularity because of its small footprint; its separation from, but relation to, a main building or house; and its multifunctional, flexible use. Ranging in materiality from wood shingles to vinyl siding, and metal panels to floor-to-ceiling panes of glass, these sheds accommodate a variety of uses, from classic garden sheds to external office space, and guest bedrooms to community tool storage. 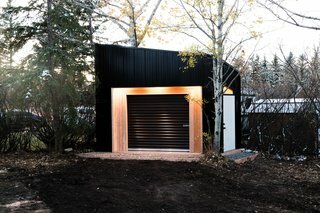 Read on for the diverse options and potentially high design that the humble shed has to offer. Linda Bergroth had gardening and storage in mind when she developed this scaled-down prefab prototype. The Finnish designer collaborated with Helsinki-based Avanto Architects for two years to perfect the compact unit—now available for purchase from outdoor brand Kekkilä. The structure is comprised of sheets of glass and steel armature, and a wood shed hugs the rear facade. 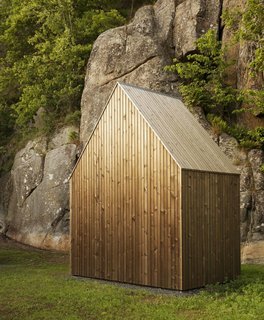 For their Micro Cluster Cabin, Norwegian architecture firm Reiulf Ramstad Arkitekter designed a shed that stored firewood and gardening supplies, and that unmistakably was connected with the main house through its steeply gabled roof and aged pine cladding. To accompany and complement his family's main house, architect Gerald Parsonson designed this easy, informal shed that adequately addresses the beachy life of the family. The site includes a boat shed and a tractor the family uses to pull their boat to and from the ramp. 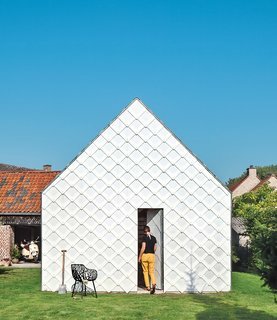 Architect Indra Janda hand-cut sheets of polycarbonate into 15¾-inch square shingles and clad the entire timber structure—a gabled roof and walls—with them. 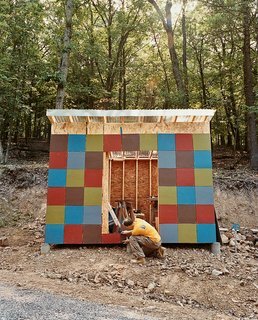 The patchwork panels of this shed were culled from leftover siding and materials from the construction of the main house, a rural retreat designed by Resolution: 4 Architecture. The 1,000-square-foot pavilion was completed in 2009 as a volunteer structure and tool shed—though today it's used far more by the public than initially anticipated. "The garden was wiped out after the storm," McKay recalls. "There was nothing, zero. Volunteers came in and replanted everything." 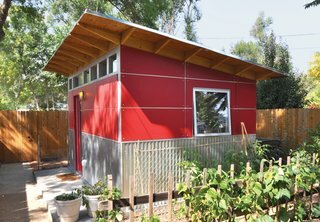 When a Colorado web designer’s newborn daughter moved into his home office, he relocated to this cool shed made of ruby-red Collins Truwood Siding and corrugated metal, just a few feet from the back door of his house. A simple but elegant custom shed was designed by Drop Structures for the storage of two motorcycles and two kayaks for an adventurous client. 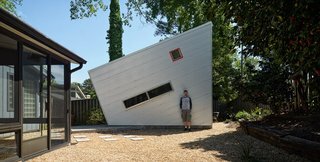 Dorman, while not an architect by training, had envisioned an office shed for his art projects, and began by researching prefab structures. When he realized that his needs wouldn't be met, he decided to come up with his own design, thinking "I want a cool space of my own." 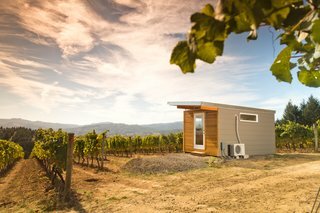 Modern-Shed built a compact, stylish "home" office in the vineyard of a winery in a lush valley in Eastern Washington. The space provides a convenient work space for entrepreneurs. 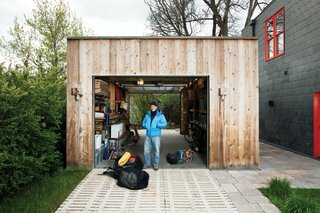 At a laid-back home in Bozeman, Montana, homeowner Brian Whitlock clad his tool shed with rustic wood. Two garage doors roll up for maximum flexibility from front to back, and simple light fixtures on the exterior are practical but also in keeping with the structure's design.